Recently however, a new deal was announced: The 4-Park Magic Ticket. It immediately caused some confusion about how it can be used. Folks wondered if this would save them money and if it really is a good idea to purchase this ticket. It's always best to book Disney with a Travel Agent. 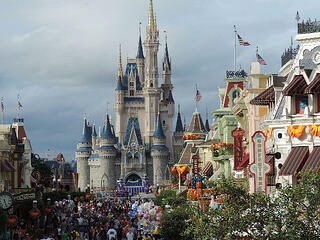 Disney prices are exactly the same whether you book yourself online or work with a travel agent. Let's face it, Disney makes it super easy for you to spend your money. (Why do you think every attraction ends with a walk through one of their gift shops?) Your travel agent will give you customized attention and help you plan wisely to insure you get the most and best vacation for your money. So let's clear up some of the confusion about the new 4-Park Magic Ticket. The 4-Park Magic Ticket gives ticket holders admission to each of the four Disney World Parks one time. What this means is that the ticket is good for a single entry into the Magic Kingdom, a single entry into Epcot, a single entry into Hollywood Studios, and a single entry into the Animal Kingdom. You may be wondering why I wrote it out that way, but it's to impress upon you that this ticket gets you into the park one time. You can stay from park open to park close, or you can stay for an hour. It does not matter - once you leave the park, the ticket will not get you into that park again. A traditional one-park per day ticket allows you to come in and out of the park as many times as you like during that one day. This ticket also cannot be used, for example, to visit the Magic Kingdom for two days out of the four - you must visit each park. The ticket must be used within 14 days of using the first park admission, or by May 26, 2017, when all tickets expire. In addition, there are block out days - you won’t be able to use this over the Christmas or Easter holidays. So what’s the savings? The best way to tell you the savings is to show you sample prices for a family of four: 2 adults and 2 children under age 9. Is this the right ticket for me? Do you have dining plans outside of the park you’ll be at? Do you have small children or people who will need to leave the park for a midday nap or break? Do you want to visit more than one park in a given day? ----if you answered yes to any of these, this is not a good choice for you. Do you want to and are you able to stay in a park for the full day? Do you only have four (or even 3) days to visit Disney World Parks? Do you want to enjoy the amenities at your resort, Disney Springs, and the other non-park attractions at Walt Disney World? ---if you answered yes to any or all of these, this could be a good choice for you. Of course there are many other reasons that this may or may not be a good choice for your family. Again be sure to talk to your travel agent about your plans and expectations for your vacation. And remember, the 4-Park Magic Ticket can only be purchased until March 5, and as noted, expires on May 26, 2017.